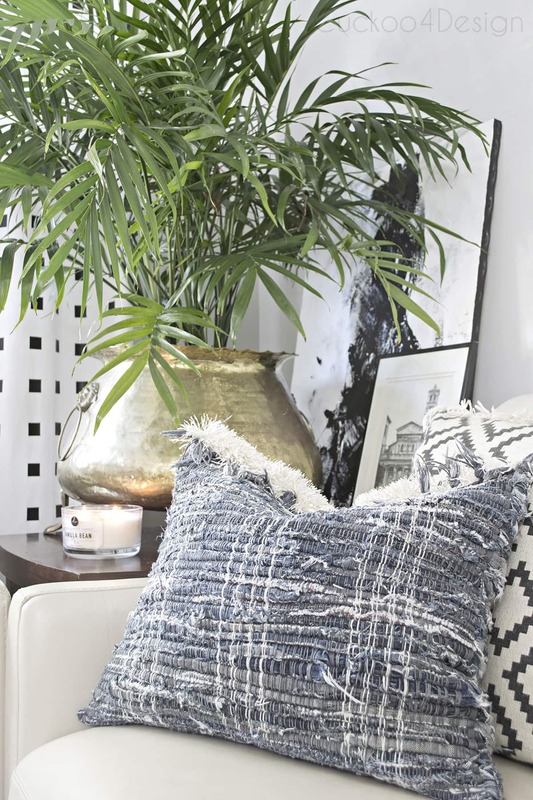 I promised in my last home tour (click HERE) that I’d talk about how I made the fringed blue boho throw pillows. The DIY started with my new favorite Goodwill finds which are the $4 jeans Chindi rugs. They are also known as jean rag rugs. 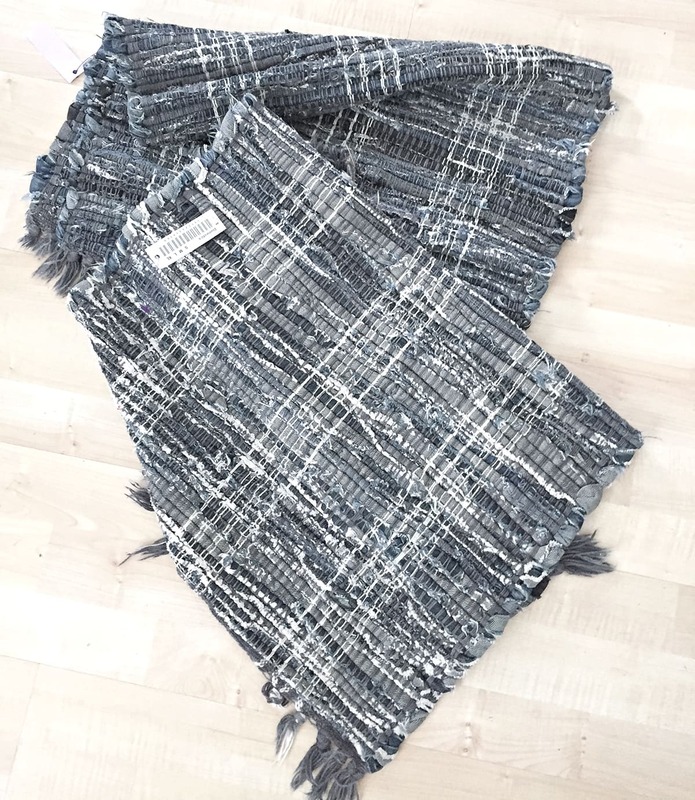 I always quickly glance at the textile section at thrift shops and was so excited when I spotted those two awesome handmade jeans scrap rugs. Isn’t it a great price too? I had been looking for new blue decorative pillows for my sofa and these DIY pillow covers are the perfect fit and price. Before I got started with the DIY pillows, I thoroughly washed the small jeans rugs in my washer and let them dry fully. I used upholstery needles and thread ( click HERE). Both needle shapes work great. It is definitely preferential if you’d like to use a straight or curved upholstery needle. I ended up using black upholstery thread for the pillows instead of blue because it’s all I had but you couldn’t even tell since some of the jean colors are very dark. Fold the rugs in half. This way you already half one closed edge. Then start sewing the two sides on each side of the bottom closed part of the future pillow and leave the top part open. I used a simple loop stitch to close the sides. But you can be pretty much as simple and messy as you want to be for this project because the beauty of it is that the stitches are not visible at all. 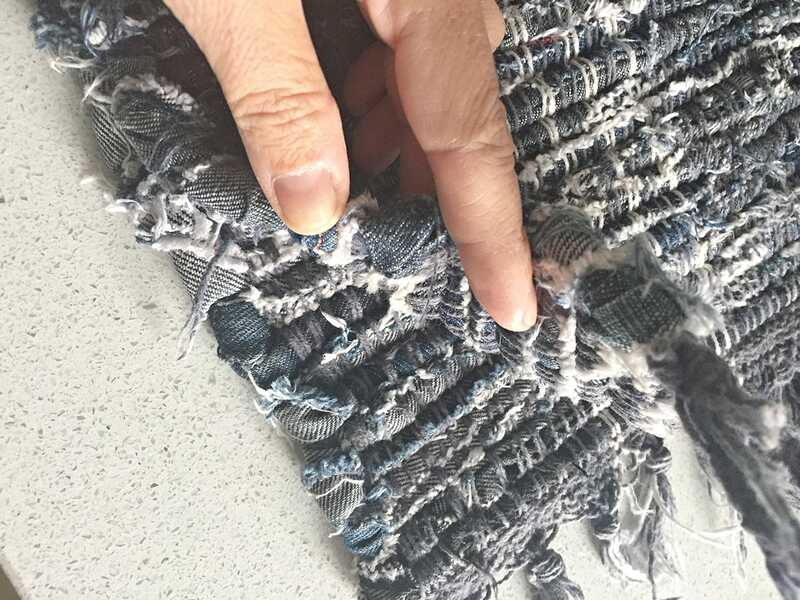 The texture of the jeans rags hides it all very well. The edges of the rugs were really thick and it wasn’t easy to get the needles through. But it’s doable for sure as you can see. After that I inserted or lets called it stuffed the pillow with the pillow insert to get ready to finish the top edge of the pillow. I had purchased the above mentioned brush trim on Etsy for another project but when I came up with this DIY pillow idea, I knew that the trim would be perfect. You should be able to find this trim at a fabric store like Joann’s. 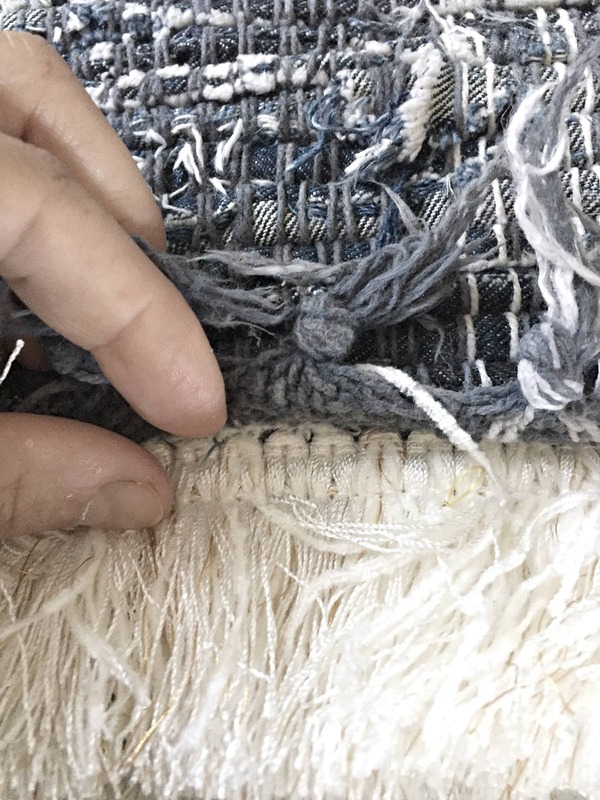 I sandwiched the fringe between the rug ends like you can see in the above photo and used the big upholstery needle to go through all three thick layers. It’s like sewing big sandwich together. Once again don’t worry about messy stitches. The rugs hide them well here too. See below you can’t even tell that I used black thread. DONE! 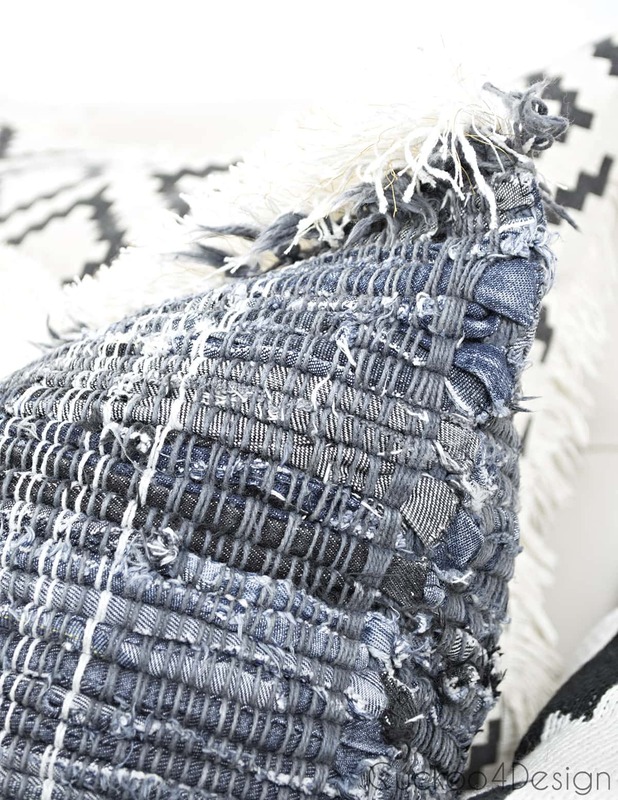 Thats it and you have beautiful jeans rag rug DIY pillow covers. When people come to my house they can’t believe that these fabulous boho pillows are actually upcycled Goodwill finds. That’s always the best part! 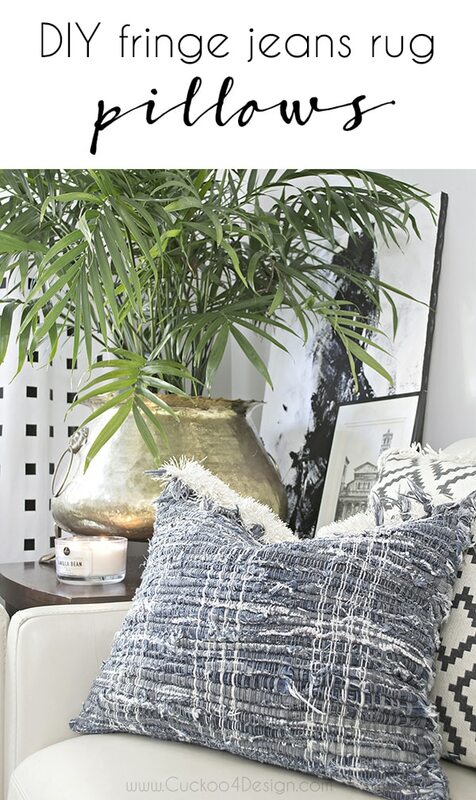 I love the added texture and boho feeling they ad to my living room. The pillows have the perfect shades of subtle blue too. And if DIY isn’t your thing then you can find similar pillows HERE and HERE. You can find more DIY pillow ideas HERE, HERE and HERE. 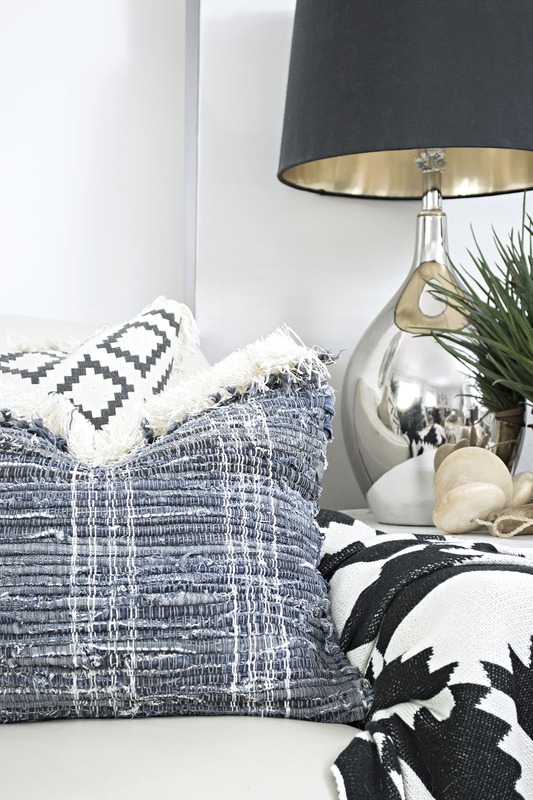 The jeans rag rug DIY pillow covers are overall a really simple project but add so much to our living room for a great price. So what do you think, are you going to check out the textile section at the thrift store from now on? I’m certainly glad I did. these look so fantastic! i want some! 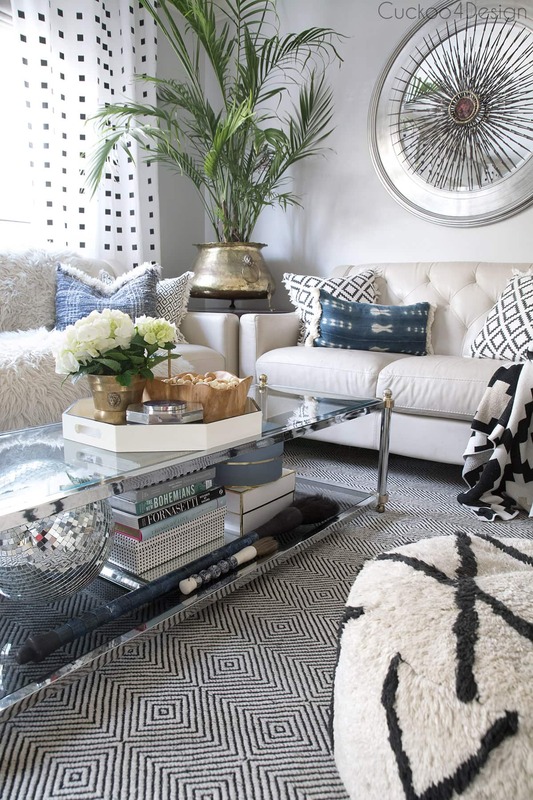 i need to find rugs like that- the color and texture are perfect for my home! Love them. A stroke of genius! I love the result! Nice pattern! I love these, Julia! The mohawk fringe is my favorite part! Another amazing DIY as usual, Julia. I don’t remember if I told you I’m deeply in love with the furry pillows. This instruction is really helpful for me as well as others who also love this pillow model. Thanks a lot! Thanks for sharing useful tips! Have a successful and healthy Fall! 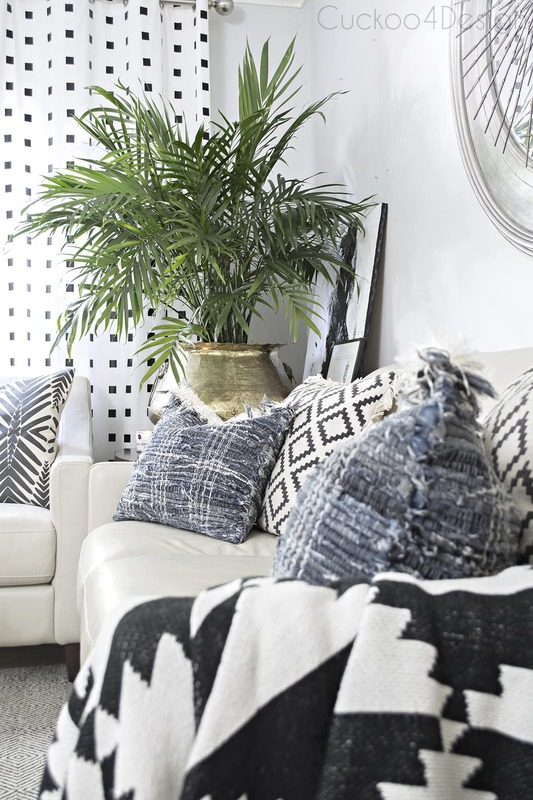 Those Chindi rug pillows are amazing! Especially the deco-ish ones that sort of fan out- so much style for such a small item! Will definitely try one making some if I have free time.